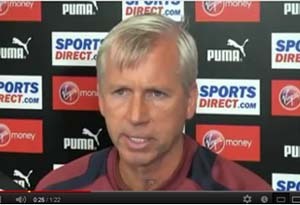 Interesting press conference with Alan Pardew ahead of today’s match against Aston Villa at St.James’ Park. As well as talking about the closing transfer window and the cup challenges, the manager spoke extensively about the Villa match. “We rested 7 or 8 first team players (Atromitos home match) and they’ll all be available for this game. Aston Villa will find we are in good health. If we can get 3 points then 6 points and getting into the group stages of the Europa League will be a great start for us in terms of the games we had”. I can’t disagree with the manager’s assessment and as he said the other day we could have got two draws in teh league which we’d all have been happy with but it would have amounted to one less point than the Spurs win gave us. With unconvincing starts by Arsenal, Spurs and Liverpool it shows that once again there could be everything to play for but the most important thing is week in week out to beat the likes of Villa and others, everything else will then take care of itself.